If your swollen, puffy eyes are the first thing people notice, it’s time to deflate them back to normal size as quickly as possible. Puffiness is caused by excess fluid, so diffusing it allows the skin to return to looking rested and refreshed. Using some basic household items and arctic blast temperatures, you can instantly see an improvement in the delicate skin around the eye. Just don’t be too rough, or the skin could swell even more. Locate two small spoons and place them into a refrigerator for five to ten minutes. If you don’t have access to a refrigerator, run the spoons under cold water from a faucet or place them in a cup of ice. Remove the cold spoons from the refrigerator and lie down or sit down in a chair that allows you to lean your head back. Place the spoons over each of your eyes with the cupped portion facing down toward your eyes. Leave the spoons in place for 30 to 60 seconds to begin reducing the swelling and then remove them. Open a tube of hemorrhoid cream and squeeze out a pea-size amount into one hand. Dab a little on one finger and then spread it over the puffy skin near your eyes, being careful not to get the cream in your eyes. Hemorrhoid creams contain an anti-inflammatory agent that helps reduce tissue swelling. 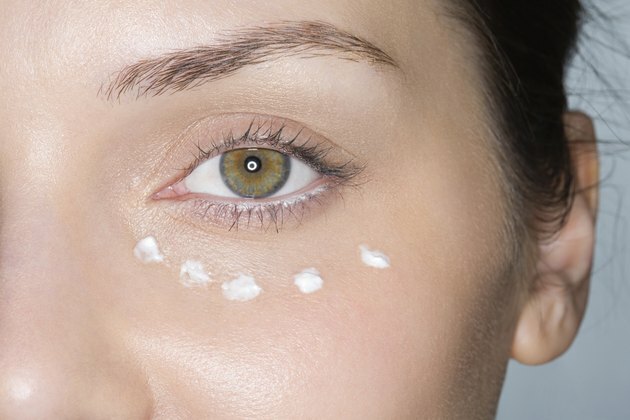 Tap the puffy eye skin gently using the pad of your middle finger for 30 to 60 seconds. Use very gentle pressure and do not rub the skin. Patting the skin is a form of massage that helps the excess fluid drain out of the eye area. To prevent puffy eyes in the future, reduce your intake of sodium and try sleeping with your head elevated on two pillows. For additional cooling effects, place the hemorrhoid cream into the refrigerator for five minutes before applying it to the skin. If the puffiness does not go away in 24 hours or if it is accompanied by pain or impaired vision, see a physician immediately as you may have a more serious eye condition. Hemorrhoid cream can be very drying to the skin. Be sure to use an eye cream to offset the drying.